Epilators have loads of tweezer heads inside the device that will catch the hair & pull from the roots. This works by having tweezer tips on a head that rotates and that come close to one another and pull apart once per rotation. This is how the tips of the plates catch hairs between them in a tweezing action, pulling them and releasing. When you clean your device you see all the hairs it pulled out at the bottom of the rotating plate. In 2012 I reviewed my first epilator, the Silk-epil 7. To read more about that model _click here. How does the Braun Silk-épil 9 SkinSpa work? 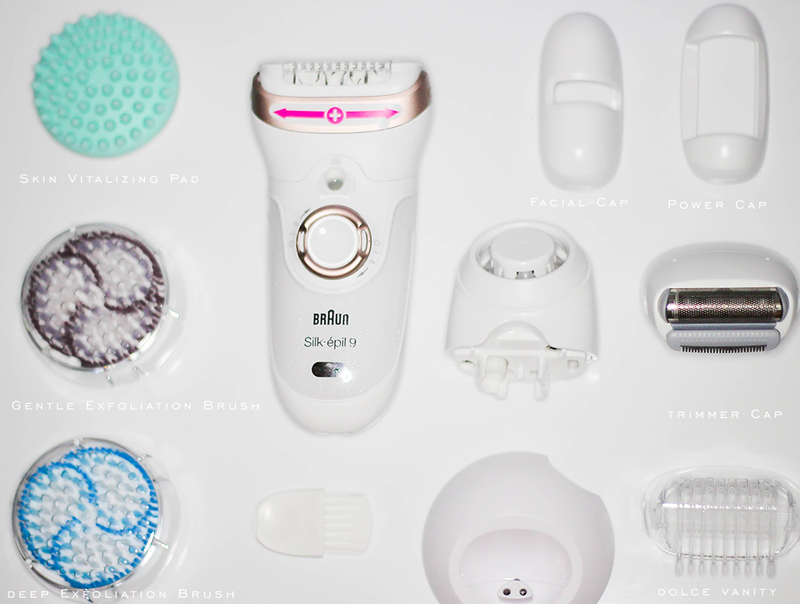 Being a 4-in-1 epilation featuring 12 extras, really these include: Braun Silk-Épil 9 Epilator, Skin Vitalizing Pad, Deep Exfoliation Brush, Gentle Exfoliation Brush, Protection Caps, Power Cap, Facial Cap, Shaver Head, Trimmer Cap, Cleaning Brushing, Smart Plug & Pouch. This allows you to use it wet & dry. Within the extras you get a deep massage pad to help improve skin tone & appearance, two exfoliation brushes for gentle & deep body exfoliation & a shaver head & trimmer cap. Effectively changing your epilator into a shaver head & trimmer cap so it's a fully functioning electric shaver, ideal for use in sensitive areas. Pulsating vibration that provides an extra gentle skin sensation during epilation to reduce discomfort. Pivoting head that smoothly adapts to every contour. Smartlight allows you to see the finest hairs for thorough hair removal. This has a 40% wider head in comparison to the other models, with Braun’s revolutionary MicroGrip Tweezer technology removes hair 4x shorter than wax can catch (0.5mm), to give you beautiful, salon-smooth results that last up to 4 weeks. Can't lie, I'm loving the upgrade. It's very similar to the 7 series that I already own minus the additional attachments the 9 series doesn't have a sensitive cap for intimate areas aka bikini line, for me that's not much of an issue. I did find this one to be more powerful and quicker than my previous model, for both legs it took me 30-45 minutes, previously my last one I'd have to recharge after one leg lol. I was either extremely hairy or the battery wasn't as good as it was used. My hairs will be smooth for about 5 days maximum, which for me is amazing - a wax will last me about 8 days. Being able to use this wet, I can lay in the bath and open up the pores making it much easier for me to remove even the smallest of hairs. But regardless I always exfoliate first using my korean italy towel before remove hairs just in case there's any ingrown hairs. Reading the manual is necessary it let's you know everything you need to know about this model. 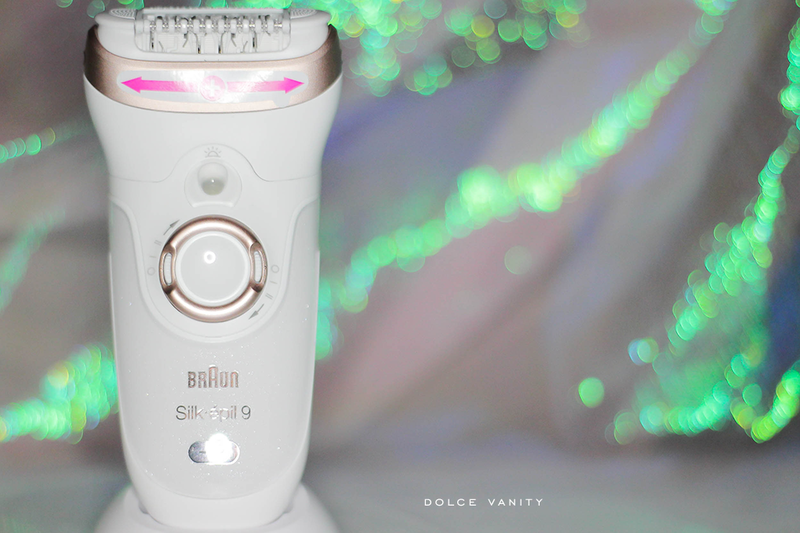 I'm looking to take my epilating to the next level with this one, I already have used the Braun Face 831 model /_read my review here for my facial hair removal and I still enjoy it but I'm going to try using this one frequently for removal. All in all, I'm pretty satisfied with all this has to offer, if you do have the 7 series you may not need the upgrade but if you're looking to, look no further. What's your hair removal preference? Buy: Braun Silk-épil 9 SkinSpa £179.99. I’ve never tried epilating before - the idea of the pain really puts me off! You're welcome, haha yes well this is true it can make a difference. I'm quite a hairy bih so getting rid of that hair is much welcomed. I'm also not a fan of epilators but I actually got curious to try using this. I' hesitating though because it feels like it's going to hurt. Have a warm bath first babe, it'll help a lot more by opening up your pores making it easier and as you constantly do it, you'll get used to it. Looks like you totally loved using the epilator and glad that this model is better than the previous one. Definitely did, there's not too much of a difference besides it seems to last longer and the additional attachments. I have never used an epilator before but I have read about them before and definitely want one. I've never used an epilator but I really want to try one. Shaving is such a chore and I never seem to find the time for a wax.